Shooting in Enter the Gungeon feels responsive and tight. 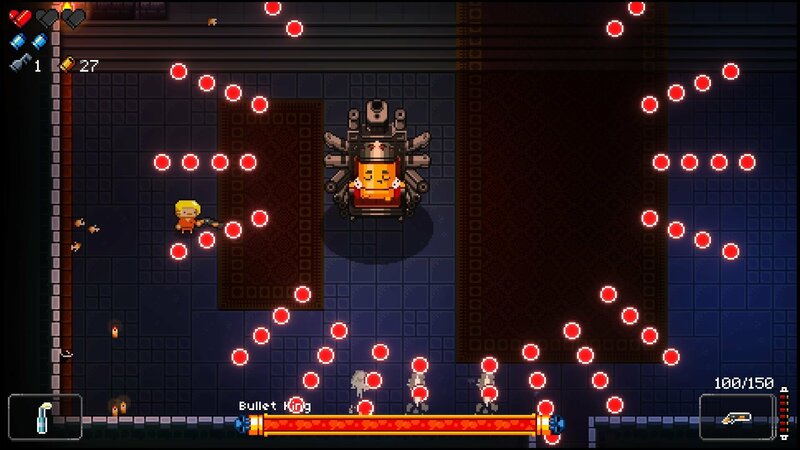 Fired bullets have a slow to moderate movement speed, so they are manageable on their own, but in a room filled with enemies things can get frantic quick. There’s a good amount of enemy variation. Simple enemies, like the standard bullets and shotgun shells, are easier to deal with, but books that shoot letters or apprentice gunjurer’s that shoot shapes can be a little tougher to manage. Interacting with the environment is fluid, running over a pile of books sending papers flying everywhere. There are a lot of small objects to destroy in Enter the Gungeon, like barrels, suits of armor, and globes. But flipping tables was probably the most fun. As it blocks a good amount of bullets before falling apart, the table flip is used to create cover when fighting. There was something completely satisfying about flipping over a table with food on it, or flipping over a table with a stack of books on it, and watching as the items flew everywhere. The boss fights are overwhelming at first and the amount of bullets on screen is staggering, but they become more manageable and even easier the more you memorize the bullet patterns. The bosses in each dungeon are different and the first level can feature either the Bullet King, the Trigger Twins, or the Gatling Gull. Each boss has a different style of attack and they all felt unique. Most good runs were ruined by poor execution in later rooms. Even in the moments where I would get overwhelmed and die, the system was never unfair though, and I just felt I needed to do better the next time. There are over 170 guns in the game, and they range from the Tommy Gun to a mailbox that shoots junk mail and even a gun that shoots ice cubes. Having this many options really helps when playing though the dungeons multiple times. On many occasions, I would buy a gun just to see how it fired. Some guns are fantastic, some are hilarious, and some are awful. It all depends on what type of roll you get in the Gungeon. Players can’t choose what guns they’re going to use on a specific run, they’ll either get them from the vendor or from drops in chests and after killing bosses. The drop rate of credits and keys are low, and while it’s nice to see a game that forces players to make choices instead of giving them the chance to have everything, it would have been great to be able to have more of a selection of starting weapons. The only way to choose which initial gun players will use when entering the Gungeon is by choosing the main character. There are four main characters to choose from when starting the game: the Solider, the Hunter, the Pilot, and the Convict. Each brings different weapons, talents, and abilities to the Gungeon. The Soldier has very accurate shooting, and the pilot has a discounted rate at the vendor. The hunter has a companion that can dig up loot, while the convict has a damage buff when getting hit. All of the characters are balanced, and no one character feels overpowered. The game supports two player co-op, which introduces the Kid, a fifth playable character in the game. But the second player can only control the Kid. It’s cute that the second player shoots darts, but after playing through the Gungeon a couple times it would have been better to have the second player able to choose from the main stable of characters. 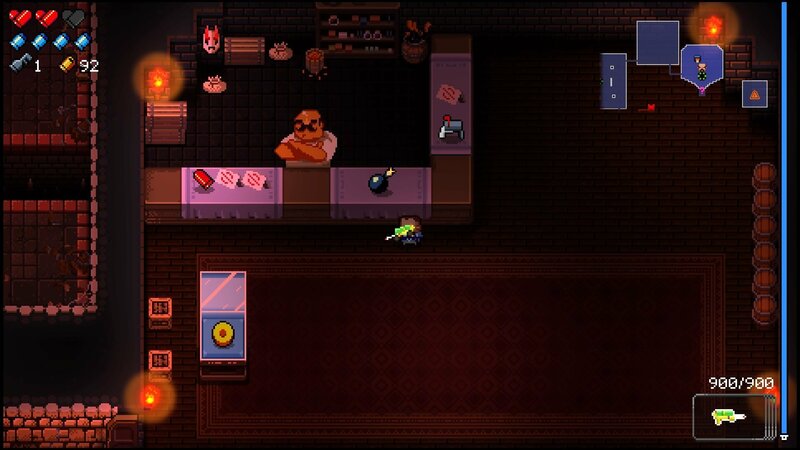 Combat aside, there are great character moments in Enter the Gungeon, the NPCs varied and unique. A vendor can be found somewhere in every dungeon, and if players repeatedly fire their guns in his room, he will raise the prices of the items. If players can’t control themselves and keep firing, he will pull out his shotgun and fill the room with bullets. After that he’ll close up shop and be gone from subsequent dungeons on that specific run. NPCs will populate the Breach after rescuing them from the depths of the dungeon. Some will offer side quests while others a chance to interact. One moment in particular stands out, when I accidentally kicked an alien’s helmet off the ledge. 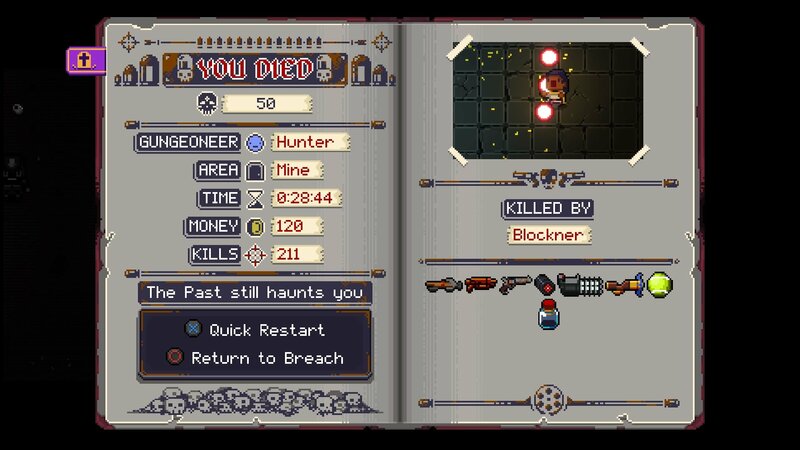 He had to go back down into the Gungeon to grab it and got locked up again. The second time I freed him he was less than excited. It’s character moments like these that bring life to the game. The random level design is interesting, but can be very frustrating as well. Many times, to complete specific tasks, I had to wait for a particularly good roll of the dungeon itself to complete the mission. One issue in particular arose when needing 120 credits and 3 keys for a stage of fixing the elevator. Not only did the task take a perfect run through two dungeons, but it needed a perfect drop rate too. It takes the control out of the player’s hands and places it into a random dice roll. Another issue with the random level generator when trying to rescue NPCs. Many times the NPCs didn’t generate in the later levels, which led to having to run them over and over again just to get the NPCs to appear. It’s great to have a random variation to the game, but story pieces like rescuing people or completing missions shouldn’t be completely random. Enter the Gungeon truly is a classic bullet hell dungeon crawler that will challenge players with its need of precision and patience. With great shooting mechanics, a constantly shifting dungeon, and a lovable 8-bit design, this is a game that will keep players heading back into the Gungeon for months to come.